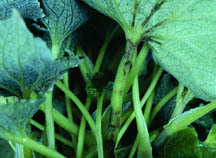 Another option for detecting tospoviruses is to send a plant sample to a plant disease diagnostic clinic. 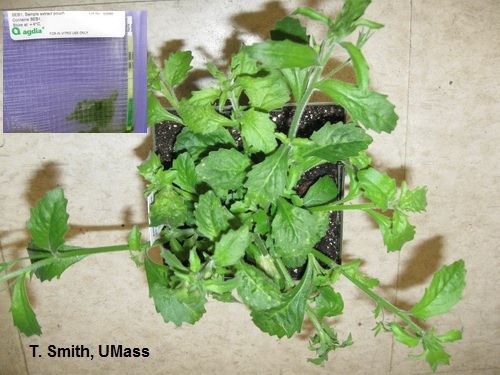 Samples may be sent to the University of Massachusetts Plant Disease Diagnostic Lab , 101 University Drive, UMass, Amherst, MA 01003 (a fee will be charged). 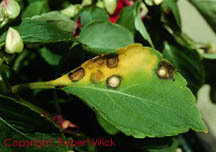 One problem with testing for viruses is that some host plant species do not express TSWV or INSV symptoms until long after the initial infection. 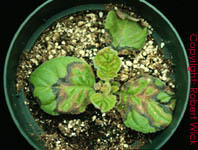 Cyclamen, for example, can show no symptoms for up to two months after infection. L.B. Stack New England Greenhouse Floriculture Guide,  A Management Guide for Insects, Diseases, Weeds and Growth Regulators. New England Floriculture Inc.